I have been digging around in the archives of my trusty old Kodak P&S lately and found a bunch of photos that I am actually really happy with, but have never posted for some reason. Since I haven’t been able to get out shooting much in the last few weeks, I figured I take a little time to show you some of them. They span a period of about 18 months and are from various places including my in-laws’ farm, Sauble Beach, and Heber Downs conservation area in Whitby. This first one is from the back path at the farm. It cuts between a two fields and leads from the milking barn down to Kim’s grandparents house. So pretty in the fall! This entry was posted in Landscapes, P&S, Photo of the Week. Bookmark the permalink. We’re pretty lucky with the fall colours here for sure. 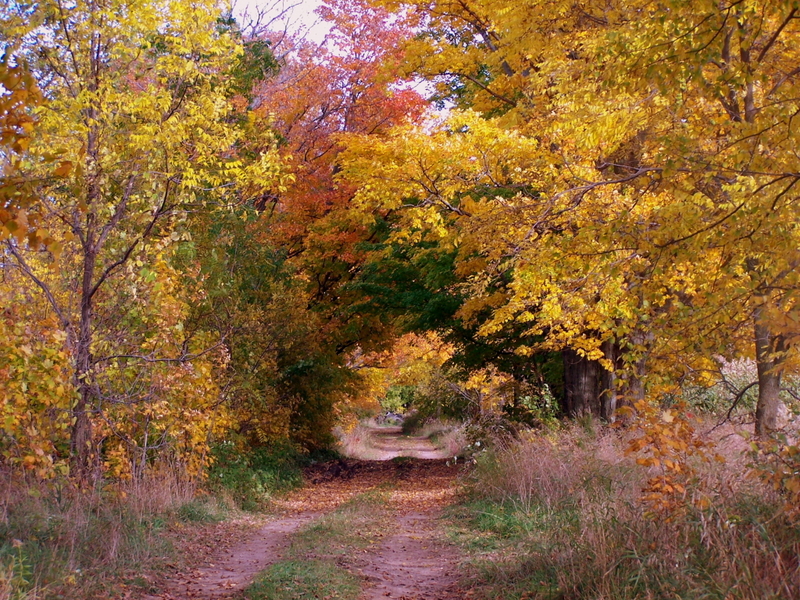 Hiking or biking around Ontario in the fall is a spectacular site. I have to say though, I wouldn;t mind ducking down your way to see the redwood forests – your pictures from there are amazing! What a beautiful path. We don’t get Fall colors like that where I live.